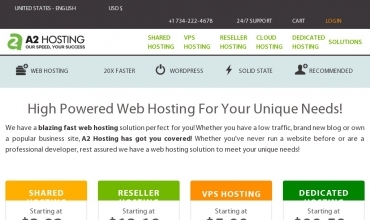 A2 Hosting started out in 2003 and are well established as well as respected. Their Guru Crew, otherwise known as the in-house support staff, are available 24 hours of every day to help with any imaginable issue. These guys have a multitude of plans available so pretty much anyone can find the perfect plan for their needs. Because they believe in being up to the minute with site security and have use of the best servers, they can offer safety with minimal down time. A2 Hosting has partnered with RatePoint, which does third party testimonial authentication, since 2006. You will be happy here if you move over, I moved a little while ago and have been purely satisfied. They take care of business and have good support. This is a good enough host, they maintain all I need them too, the support is adequate, maybe not super active but alright for what I need. If you are looking around then you might want to look here. I kept trying to find out why my site had been going down so very often. It would go down for a few minutes and then pop back up. They of course, could not find a problem because it would be up again by the time they went to check. There is no way that they actually monitored my site for 24/7 as was staed. If they had, they would have seen what was happening. Probably just a ply to squeeze out an upgrade from me. I was supposed to have my site migrated to another server because of having trouble with such down time. I did not want to upgrade, even though they said that would make things work finer. After the site was migrated i was unable to tehn access my site. they said this was because it could not be connected to the postgres database since it was moved. My website was going down a few times a week. They suggested that i switch to a VPS, for me to pay more and get a dedicated hosting plan. I personally could not fathom paying more with them with their promise of having more up-time and better service?? Instead of being able to fix the problem with the downtime they tried to tell me that it was my website that was having the trouble. My experience here is fine, nothing extraordinary but nothing horrible either. Support seems to know what's going on so that is always a good thing. Finding a host is tough but I would give these people a shout as I haven't had any major problems as I have in my past with others. My time here has not been long but so far am satisfied with their performance. They were helpful moving me over to their site, there were some issues with uptime at the beginning but it seems to be getting better.